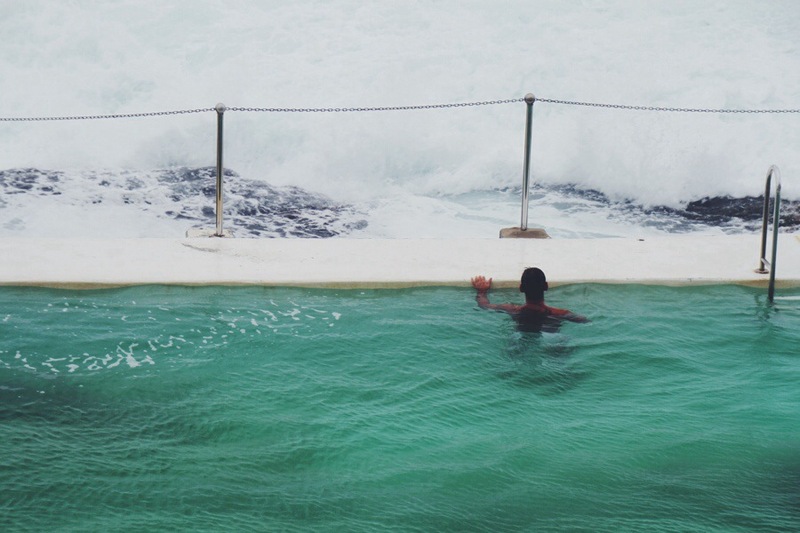 Judging by the fact that two different locals asked us how we found it, I’m guessing the Bondi Icebergs Swimming Club is somewhat of a hidden gem. At $5.50AU per adult for a scenic oceanside swim, I’d say it’s a steal. Since 1929, the saltwater pool has given people the chance to swim laps (sans-sharks) by the sea, with crashing waves spilling in and seagulls flying overhead. The bar upstairs, perfect for a glass of wine and breathtaking view after a swim, doesn’t hurt either. Unfortunately for us, the weather in Sydney had been unseasonably chilly for mid-summer, even moreso at Bondi Beach where the wind was blowing unforgivingly. After watching the swimmers for several minutes and seriously contemplating a hot coffee instead, we decided that leaving without a dip would be a regrettable choice. So we paid the small fee, changed into our swimsuits, and braved the chilly turquoise waters. It really wasn’t all that cold once you got in and moved around, but my fingers didn’t get the memo. Within a couple of minutes, my wedding band abruptly slipped off (for the first time ever) and sank. Immediately, I stopped and flagged down a nearby lap-swimmer and asked if he could find my ring. His eyes weren’t too good, he told me, but he tried briefly anyway, returning empty-handed. Surrendering his goggles, Kristen dove down and within her first breath, surprised both of us and found it no time (see her face in the video: genuine disbelief upon surfacing). Good thing too, because if I'd lost it, she would’ve had a fit. During our post-swim de-stressing sauna session, we chatted with an expat from Tucson who has lived in Sydney for 8 years (spoiler alert: he loves it). He recommended Nina’s Ploy Thai for dinner, so we took his advice and, after a short walk down the beach, found the BYO hole-in-the-wall restaurant filled with decidedly Australian locals. The bare, white walls and simple tablescapes (read: a box of tissues) made us feel right at home. 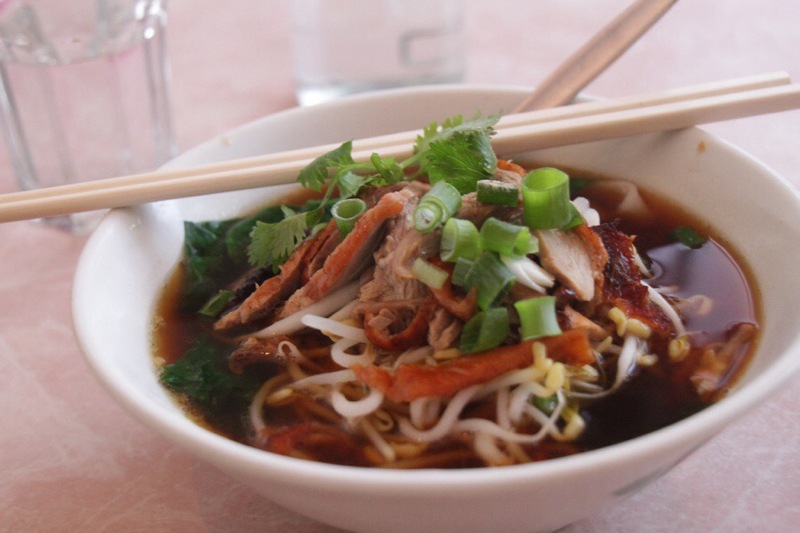 We ordered duck noodle soup and drunk noodles, and savored every mouth-watering bite. 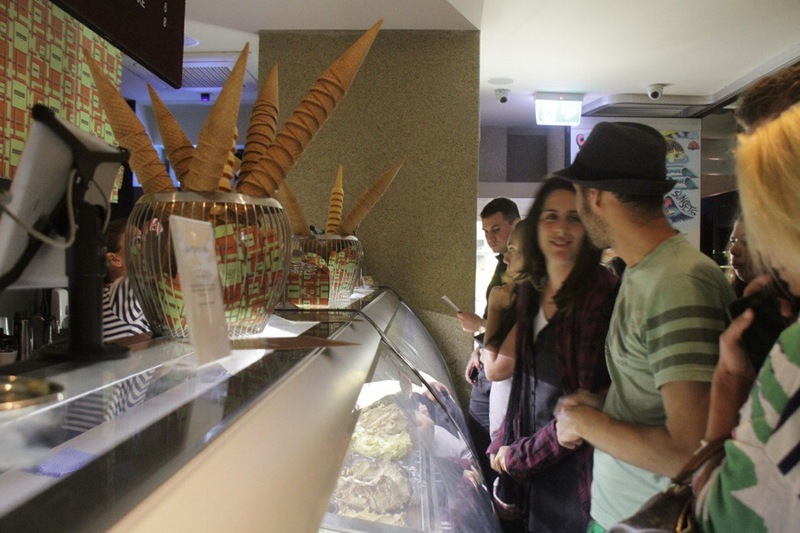 To round out our Bondi bonding time, we strolled over to Gelato Messina, a top-notch cold treat destination that our goggle lender had raved to us about. The open-air “bar” felt like a movie premiere, with excited fans queueing up and spilling onto the sidewalk. Our espresso/chocolate and pear/rhubarb scoops were decadent and delicious. As we walked off in search of a bus back to our hotel, very full and very happy, we had absolutely zero regrets. Disclosure: Even though I'm traveling in Australia on behalf of DoubleTree by Hilton for my DTour of a Lifetime, what I write about is up to me.